ERP and CRM systems use two different aspects deployed to increase profitability. ERP can reduce your business overheads and its implementation can minimize costs. It ideally makes your business processes more efficient by cutting down of capital spent on those processes. At the same time a CRM may be deployed to increase profits by producing greater sales volume. On the most basic level, Salesfundaa CRM software handles your front-office activities, while Salesfundaa ERP focuses on the back office process. Even if the core functionalities are different these systems overlap in some areas and can be completely integrated to put your business into overdrive adding technological experience and lessening the gap between production, sales and profits. CRM at its simplest is software for managing a company’s interactions with current and potential customers. It is essentially used to organise, automate and synchronise sales, marketing and customer service. Salesfundaa CRM software has developed to include all areas of the customer experience. It is used to identify potential leads/prospects, nurturing them and guiding the sales team through the sales process to close a deal. Once they have made customers it is ensuring that they maintain that relationship and encourage repeat business – either more frequent orders or of higher value. 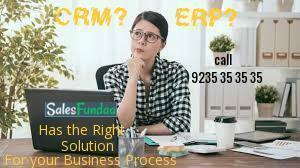 Where Salesfundaa CRM software manages the customer, a Salesfundaa ERP software is used to manage the business process. It vitally is deployed for improving the efficiency and thus productivity of business processes. It allows for the integration of data and sharing of standardised information throughout all departments. This enables business heads to anticipate opportunities and pitfalls in advance and plan by being a step ahead. To put it aptly Salesfundaa ERP provides a method for streamlining business processes across different departments in a business. Call 9235 35 35 35 for your free Demo today.